Thatcher Demko, your time is now. 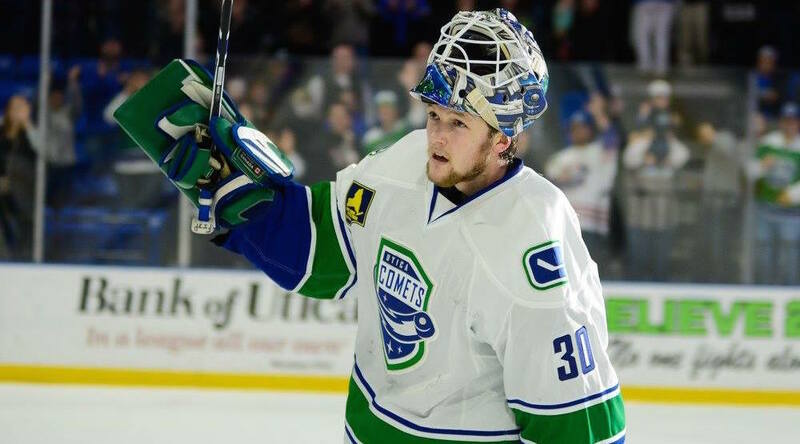 The Vancouver Canucks called up the 23-year-old goaltender from the Utica Comets Friday morning, signalling the start of his full-time NHL career. He’ll join the team in Toronto, where the Canucks are preparing for Saturday’s game against the Maple Leafs. Demko was drafted by the Canucks in the second round, 36th overall, in the 2014 NHL Draft. The San Diego native completed three exceptional seasons at Boston College before turning pro in 2016. Developing into the Utica Comets’ starting goalie quickly, Demko posted a .922 save percentage for the talent-starved AHL team last season. He played the lone NHL game of his career late last season, posting a win in a 5-4 game against the Columbus Blue Jackets. Suffering a concussion in preseason, Demko didn’t have an ideal start to this season, but currently has a .911 save percentage in 16 games with the Comets. The Canucks will hope this is the beginning of the 6-foot-4 netminder developing into their No. 1 goalie. Not everything went according to plan for the Canucks on Friday, as they lost goaltender Mike McKenna off waivers to the Philadelphia Flyers. The 35-year-old was one of the players acquired in Wednesday’s trade involving Anders Nilsson. That leaves Utica thin on goaltending in the near future. With Richard Bachman injured, Ivan Kulbakov, who was supposed to play in the ECHL this season, is their lone netminder. They’ll likely have to sign a goaltender on a pro tryout contract before their game on Saturday. Michael DiPietro, who starred for Canada at the World Juniors, will begin his pro career next season in Utica.